3.1 Which level is safe? 4 Please press here to read more about ICRNIP's, WHO, countries and our recommendations for reasonable RF and ELF exposure levels..
6.5 Measuring radiation levels in places you stay in. 6.6 Identify radiation sources outside the house. First test the levels of RF and ELF where you sleep, sit, in your working station/desk and places you stay for long hours. Scan the house for RF and ELF sources (sources hunt). When you get close to a source of EMF, the levels will go up. Scan the walls, windows, doors, floor and ceiling for RF and ELF penetration points from outside the house or from you neighbors. When you suspect an electric or electronic device is causing the high readings, turn it off or pull it out of the electric socket to see if and when the levels are changed (dropped). Find the Safety distance from every ELF field source. For RF sources I don't think there is relay a "safety distance", just exchange them with other devices that do not emit any RF. Decide if and how (when, where, how far away from) you want to use a device that radiated, according to the measurements you have done. 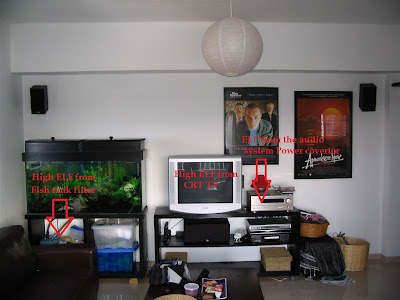 Decide if and how to protect your house from ELF and RF radiation from outside according to the measurements outcomes. measure the levels before and after installation. Use our most recommended ELF/RF EMF meter, or select a meter of your choice. Make sure the meter you are using has a fast sampling rate in RF mode (at least 1000/sec). In RF mode make sure your meter can show MAX PEAK values. Make sure you are holding or wearing any wireless devices like smartphones, Bluetooth devices. These devices are emitting RF radiation that might interfere with the reading of the meter (the meter will scene it and measure it). If you are using a smart phone to capture a video or photos of the measurement, please make sure it is in flight-mode and not emitting any RF or ELF. Make sure you are not wearing or holding ant rings or metal items that might interfere with the meter's reading. Make sure the Batteries of the meters are full of juice. We recommend using rechargeable batteries. Hold the meter in an upright position (vertical axis, Y-Axis) without having your hand block the antenna/RF sensor of the meter. Measure the ELF and RF fields when and where ever you need. Repeat the measurement, in different hours and days, until you understand the patterns of the radiation level changing over time (according to the usage of the electricity network in ELF and the cellular networks in RF) and location(according to the distance to the source). 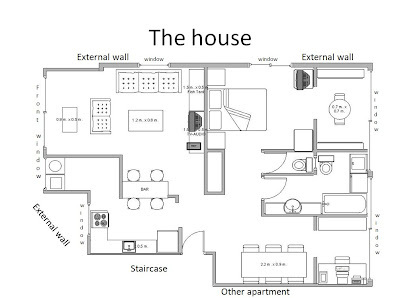 Make schematic sketching of the house. On the schematic sketching mark the locations you are going to measure with numbers. Use a table for writing down the test outcomes. Every raw should be used for a different testing point. Every column should be used for different date and time you measured. When the reading gets steady, Write down the values in a table. If the measurement keeps changing write down the Max, Mix and the value that is displayed most of the time. According to your understanding of the risk from ELF and RF, mark every cell in the table according to the level measured, red - very high level, yellow-high level, green - law level. Lend the EMF meter to friends & family so they can test their houses. Become an ambassador for EMF awareness, now that you can use the meter to show people the radiation you are talking about! and walls and search for "hot spots". The source or penetration point will usually be next to the "hot spot". In a 3 Axis meter, you can hold the meter in every position you like. In a single axis meter hold it in Y-Axis(vertical), then in X-axis(horizontal) and then in Z-axis (depth). In most cases, you will see most of the radiation only in one of the axis. In a single axis meter, while in RF mode, most of the time you will see most of the radiation in the Y axis. In a single axis meter, while in ELF magnetic mode, most of the time, 2 axis will show some levels while the third will show very low levels. Please press here to read more about ICRNIP's, WHO, countries and our recommendations for reasonable RF and ELF exposure levels..
Let's explain several basic concepts about EMF measurements. It is important to know the difference between the different types of Electromagnetic Radiation (EMF/EMR) measurements. Every type of measurement will have a different focus, different methods and in some cases, you should use different meters. The right meter should be chosen according to its characteristics and not only according to the frequency that it can measure. Electromagnetic radiation sources can be divided into 2 frequency types, low frequency (power line, power transformers) and high frequency (RF, DECT, Mobile phone, microwave). Some meters can measure both types, some can measure only one. When the radiation level is changing rapidly and when most modern RF signals are based on fast-short pulses (like in some digital radiation sources, 3G and 2G mobile phones, WiFi routers, DECT phones and etc.) it is very important (actually a must) to use electromagnetic radiation meters with a high sampling rate(at least 1000/sec). If the sampling rate is low, for example once or twice a second, like in some simple and professional meters, the measurement outcome of will be very low, when in reality the radiation peaks to high levels many times in a second. For example, if you try to measure the radiation emitted from a WIFI router with RF meters that measure the radiation once or twice a second, the slow RF meter would probably not be able to even detect the radiation coming out from the router. While the router emits/transmit high peaks of RF radiation at least 10 times a seconds. This is why I usually use electromagnetic radiation meters with the highest possible sampling rate, higher than 1000/sec, most of the time 3500/half a second). In some cases, it is the custom to make an average out of the levels of radiation that were measured. It is recommended (but not a must) to make a note of the minimum and maximum values that were measured. When average outcomes are reported it will usually mean that the picture revealed by the report will be very partial and limited since the peaks and high values that were present in some of the time were averaged by low and even zero values that were measured most of the time. In most cases, I don't use average in my measurements. I try to get a clear and full picture and try to understand what causes the high peak levels. When the measurement is changing all the time, I write down the Max, Min and the level the meter showed most of the time. Duty Cycle is measured in %. It marks the parentage of the second the signal (RF signal) was present. In case of AM and FM broadcast, the duty cycle is 100%. In the case of cellphone towers, the duty cycle is usually between 50%-80% depending on the traffic. In the case of WIFI, DECT, UMTS, and CDMA cell phones, Bluetooth devices and many more modern RF signals, most of the time the duty cycle is lower than 10%. A single with low duty cycle will be noticeable only by a meter with a very high sampling rate. The ratio between the peak value and the average measured value can give some clue about the duty cycle. A high ratio, for example Peak=1mW/m2 and Average=0.001mW/m2 will mean low duty cycle (like WIFI). A low ratio, for example, Peak=1mW/m2 and Average=0.8mW/m2 will mean a high duty cycle(like from a cellular tower). Regarding the possible biological effect of RF radiation, I think that also low duty cycle signals, like for example WIFI, have the ability to effect and disturber biological systems. These effects can result in health issues. Therefore I don't take lightly the possible health effect that can be caused by low duty cycle signals. I actually look at law duty cycle signals at the same severity as high duty cycle signals. When the Radiation levels are changing throughout the day there is a need to measure them during all the hours of the day, sometimes for several days. In most cases when this is the need, you have to use electromagnetic radiation meters that have the option to monitor the radiation levels through the day and night and to store all the results in an internal memory, which can later be reviewed, examined and processed. The most recommended meters for this operation are meters that can be connected to a PC for data acquisition, extraction, real-time and offline analysis and display of all the information gathered during the measurement. When it is not possible to use a logger, you should take the measurements again and again in different hours and days until the radiation pattern over time is understood. Please note that most of the High-frequency electromagnetic radiation meters that I encountered to date (both professional and simple) are not able to measure multiple frequencies and multiple radiation sources correctly (mobile, WIFI, cellular antennas, cordless phones, etc.). This limitation is due to the difficulty of measuring and summing up all the radiation levels in all the frequencies. Therefore the measurement of radiation sources that emit RF radiation in several frequencies (eg: WIFI, mobile phone antennas mailman third or cellular) or measuring several radiation sources at once may not be accurate and the results will generally be lower than the radiation levels in reality. It is still possible to use these meters to expose radiation sources and to understand how to shield and how to reduce your exposure from them. The only way to measure multi-frequency and multi-source environment is by using a very fast spectrum analyzer. Since the EMF safety standard around the world are very pore and based on the ICNIRP standards which are based only on short term acetic effect and don't cover any long term biological effect, we can't trust them to protect us. What you need to do is to read about the health risk, about standards in countries around the world and decide for your self to which level are you OK with exposing yourself and your loved ones. In order to make the process easier, we created a page on this site about standards and our recommendations. In general, we always recommend being exposed to as low as possible EMF radiation, to track and find the source of the radiation and to fix the problem. As far as exposure to EMF radiation is concerned, EHS people that are exposed to EMF will feel pain and suffer from symptoms. Therefor EHS people should try to reduce their exposure to the absolute minimum possible. For people who are not EHS (yet) it is recommended to reduce the exposure load as much as possible. The number of signals could be measured only by using a spectrum analyzer. This equipment is expensive and is rarely used in EMF safety surveys. So usually we will use our knowledge of EMF and RF. The level of the radiation can be roughly measured (only " roughly " because of the multi-source, low duty cycle, and multi-frequency issues, please see above) using EMF meters. The time of exposure can be easily assessed in most cases. Let's take for example the exposure of a person to EMF radiation from a mobile phone. The phone can emit several frequencies (RF) while transmitting. In addition, it will emit some levels of ELF. We don't have control over the number of frequencies emitted, but we should take that into consideration while assessing the exposure load (and while doing the measurement). The radiation level can be partially and roughly measured using an EMF meter, just keep in mind that you are not measuring all of it. The radiation level can be controlled by using the phone in an open environment (not in elevators, trains, cars or indoors) where the reception is better and where the phone will emit less RF radiation. In addition, using the speakerphone function or a wired earpiece will reduce the exposure even more. The time of exposure can be easily assessed and reduced by keeping the conversation short and to the point. In the case of mobile phone mast in front of your house, the number of signals can reach hundreds or thousands, in several different frequency bands and we can not control it. The level of the radiation will be seen at first look as not a lot (compared to other sources of RF) but keep in mind that you are not measuring all of it(see above "Multi frequencies" and "Multiple sources") and that the duty cycle is high. The radiation level can be controlled by using RF protection measures and choosing the location of where you sleep, work and sitting area where the radiation level is at minimum levels. The exposure time, in this case, is 24 hours (or as much as you stay in front of the mast). We sometimes have partial control over the time we spend near or across the mobile phone mast. In some cases, you can choose to leave the area, in some cases, for example, if you live or work in this area it is less of a possibility. Exposure load assessment is more relevant to RF since in RF there are lots of signals and since more RF communication standards are based on "spectrum spread" and "frequency hopping" which means that a single device can generate several, or many, signals. If you want to do the most basic and easy measurement please read the "Measuring radiation levels in places you stay in" chapter in this page. The official measurement protocol was created by the Israeli ministry of environmental protection and all radiation testers in Israel are obligated to follow it. The environmental protection ministry supervises environmental sources of radiation like mobile phone towers and therefore this protocol is meant to measure these kinds of sources (that are located in the environment) even when the measurement is done inside the house. The environmental protection ministry will allow the tester to step outside the protocol if the customer requests it, but the outcomes of these measurements can't be included in the official report but only as an appendix. 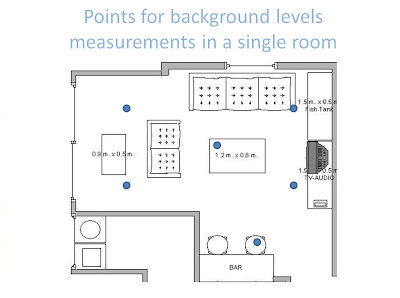 High – all measurements should be taken at the height of one meter above the floor, in case there is an underfloor heating it is allowed to measure 20 cm above the floor. Location – the tester must measure in four corners of the room, one meter from the walls and also at one point in the middle of the room. The tester can also measure radiation levels in more locations in the room but he is not obligated to do so. 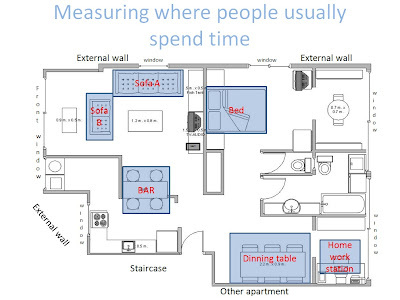 If the room is too small for several measurements, the test should measure only in the middle of it. Don't measure next to windows or radiation sources. The outcomes that appear in the official report are sometimes average calculations of the measurements that were done in the field. 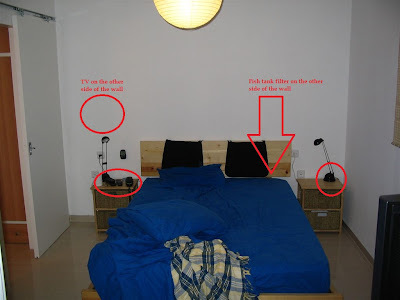 I think that this method does not give the whole picture and can cause, in some cases, disinformation especially when the customer wants to identify the radiation sources inside and outside the house and in case he wants to understand where, when and what were the highest levels. When you need to test the electromagnetic radiation background levels inside a room you better start with the official protocol above. You need to stay one meter from the walls windows doors and radiation sources inside the room. This kind of measurement can show you the background levels inside the room. It is recommended to use an advanced electromagnetic radiation meter that gives a numeric indication of the radiation in all three axis, with a fast sampling rate and with a clear and detailed display. A simple electromagnetic radiation meter can give you only a raw estimation of the levels. It is recommended to repeat this measurement twice, once with the radiation sources (cordless phones, WIFI routers, a CRT TV and etc) inside the house turned on and the second time when they are turned off. Analysis of these measurement outcomes can show you what the background radiation levels in the room are, and how the radiation sources affect these levels. If you want to understand the effect a single source has on the background levels in the room you can also repeat the test when only this source is turned on. All types of electromagnetic radiation meters, even the simplest ones, can be used for searching radiation sources in a room (the meter should be for the same type of electromagnetic radiation as the source emits, either high frequency-RF or low frequency). 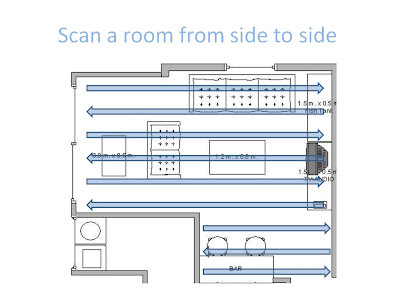 All you have to do is to scan the room step by step, meter by meter. Whenever the meter shows an increase in the radiation levels that means that you are getting close to a source. If the radiation levels are dropping you are getting away from the source. It is recommended to use a meter with voice indication that makes it easier to notice changes in the radiation levels without looking on the meter’s display. Scan in the room 3 times, once on the floor, a second time at one meter high and then at the hight of a human being’s head. The scan should include all the parts of the room. Use a clear scanning pattern that was planned before the test started (from center to the walls, or from one side of the room to the other side. 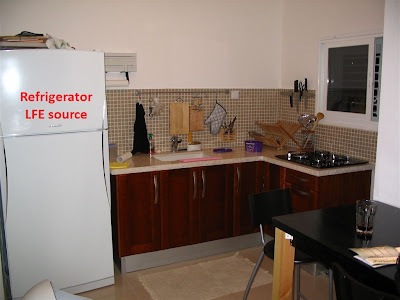 When searching for radiation sources outside the room we should focus on the border areas of the room with other spaces of the house (other rooms and floors) and with the outside, like walls, windows, doors, rooftops, and underground spaces. When there is a high-level radiation source outside the room, the first sign for that will be medium to high radiation background levels inside the room itself. 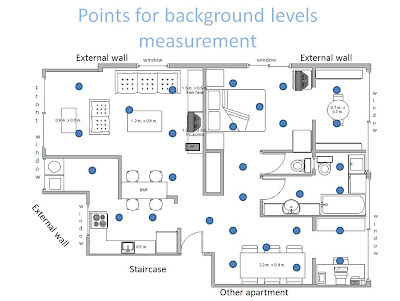 When getting close to a penetration point of RF or ELF on the walls or windows, the levels should be very high in reference to the levels in the room. Windows will usually pass most RF. In ELF magnetic field it will pass through both windows and walls. When there is a high current electric wire inside the wall, the low frequency that is created around the wire will penetrate the room. If you scan the wall, vertically and horizontally with a Low-frequency electromagnetic meter the meter will show high radiation levels near the wire, and will enable you to expose the wire as the radiation source. 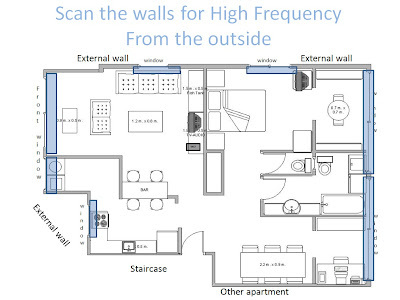 In case there is a DECT base station next to the wall in the next room, the first signs will be medium to high levels of high-frequency radiation inside the room. When the right wall will be scanned the radiation levels will increase as the meter will be closer to the DECT phone location until it will reach the maximum measurement. In some cases when there is a radiation source on the next floor or on the floor below, there will be high radiation levels next to the ceiling or floor. When there is a high-frequency radiation source outside the house, for example, a mobile phone mast, the meter will show high levels of high-frequency electromagnetic radiation mostly next to the window, and in some cases even on the wall which is in the direction of the mobile phone mast. 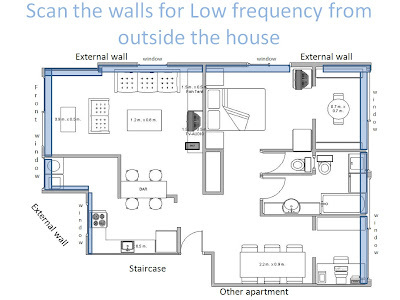 When there is a low-frequency radiation source in the near vicinity of the house (like an external electric power converter or high voltage electric power wiring) you will be able to measure high levels of extreme low frequency electromagnetic radiation in parts of the rooms of the house which are close to it (low-frequency electromagnetic radiation passes easily via walls). 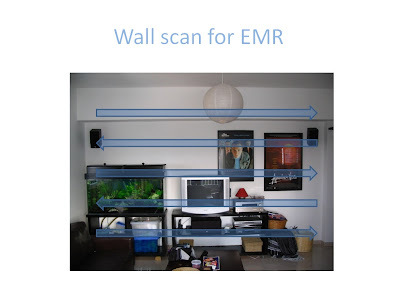 When there is a CRT TV on the other side of a wall you will be able to measure high levels of low-frequency electromagnetic radiation in the room, the pick will be on the wall next to the location of the TV (on the other side). 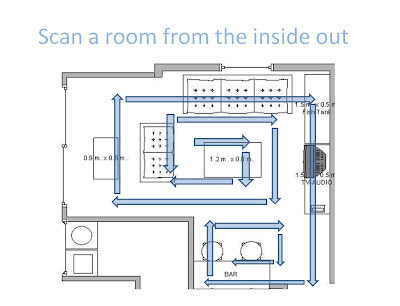 When there is an external radiation source outside the room that radiates in medium or low levels, for example, a WiFi router or a small power converter it will be difficult to locate the source by doing measurements in the room next door. In order to do so, you will need to use a very sensitive and accurate advanced electromagnetic meter with a detailed display. In this case, it is recommended taking a look inside the rooms next door in order to get some clues for the radiation source that can influence the measurement. 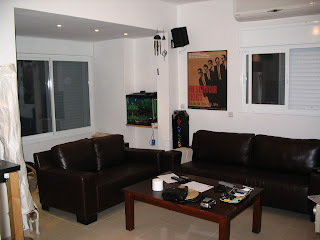 Living room with an aquarium filter, a TV and some audio and video equipment. LFE radiation sources are marked in red. The radiation emitted reaches the next room (see pictures above). Measuring radiation levels in places you stay in. The technique is to measure on top and next to the place in which the human body will be and to try and understand what will be the radiation level and for how long the body will be exposed to it. In addition, you need to try and figure out which radiation sources influence the radiation levels at this point. In the past, I came across people who told me that they found a radiation source on their home working station desk, but they didn't think that it was serious since they sit next to it only for a short time. When I asked them for "how short? ", they replied that they use it for half an hour to one hour each day. I just want to make it clear; I think that every exposure to electromagnetic radiation is not good and should be minimized as much as possible, and if possible to reduce it down to zero. Half an hour a day is not a short time as much as exposure to radiation is concerned, it is a lot of time. Whenever there is a radiation exposure it is highly recommended to try to find the source and turn it off so there will be no radiation emission (no radiation for you :-) ). Identify radiation sources outside the house. In order to identify high-frequency radiation sources outside the house, you need to use a directional radiation meter (the meter should have a directional antenna). The trick is to hold the meter in front of you and to scan the 360 degrees around. When the meter will be directing to, or will be closer to a radiation source, the radiation levels will usually be higher than when the source is not in front of the meter or far away from it. If you are using a 3 axis meter it is best to configure the meter to measure only in the axis which is parallel to the axis of the radiation source (for example axis Y for mobile phone masts). Identifying EMF sources and penetration points to your house or office from outside the house (Neighbors, Cell phone mast/towers, power lines ...) should be done by scanning the walls and opening(windows and doors) of the house(including internal walls). If you or your neighbor put an EMF source to the wall, you should be able to see higher and higher levels of radiation as you get closer to the penetration point while you scan the wall. Even if you can't actually see the source, the radiation penetration points should be visible. 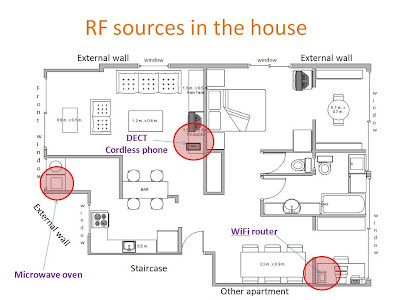 In RF radiation from cell phone towers (or other outdoor communication infrastructure), most of the RF radiation will penetrate the house through the windows. Therefore you should give priority to scanning the windows first while searching for RF penetration points. Identifying low-frequency radiation sources outside the house is trickier since low-frequency electromagnetic radiation is less directional than the high frequency. The search for the source should be based on getting closer or going away from the radiation source while trying to look and guess where the low-frequency radiation sources are located in the near vicinity. To my humble opening, as far as RF radiation is concerned, there is no safe distance from an RF source. 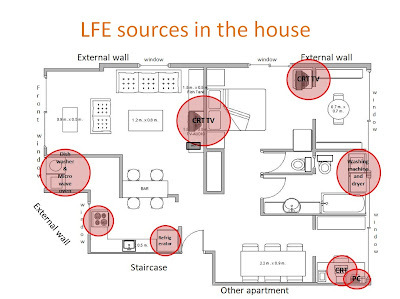 Home use RF equipment reaches working distances of 50 meters and more inside the house, and even greater distances outside the house. 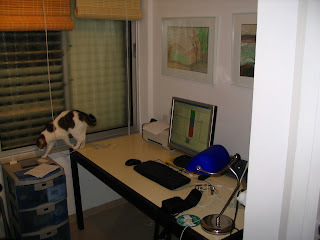 Since I think there is no healthy level of RF radiation, and since we understand that as long there is "reception" we have radiation, then as soon as you put a wireless devices in the house, there could not be safety distances from it, even if the RF meter show low levels from it, as long there is reception, there is radiation. However, It should be cleared that as you move away from the RF source, the levels will be lower, and your exposure will reduce, but I don't believe it is reasonable to say or determinate safety distance from wireless equipment, especially when it is broadcasting 24X7. As far as ELF Magnetic fields go, finding the safety distance is relatively easy. 0.5 -2 meters should be enough distance from in-house ELF magnetic sources. If you are using a single Axis ELF magnetic field meter, you should first measure in the same point in space, in all 3 axis to find the axis with the highest reading. In a 3 Axis EMF magnetic field meter, it is enough to find a spot next to the source that allows you easy measurement. Then start to move away from the source and watch the levels go down. As soon as the level goes down from 2 mG(or a level you consider safe), it should be considered OK to pass or stay in this spot for a while. Continue to move away from the source and watch the levels drop until the level reaches the background level, or/and the source stop influencing the meter. You can then add 50cm (just to be sure) to reach full safety distance.